With their big teeth and jaws, crocodiles might seem a bit scary to toddler-aged children. Learning about these magnificent reptiles will be fun with a few simple crocodile crafts to make on their own. Assist toddlers in folding the sheet of green construction paper into three sections the long way. Using Scotch tape, secure the ends of the folded paper. Assist children in folding the green construction paper again. This time, fold the ends into the middle so that they meet. Next, fold the whole thing in half but folding the ends out. This will create an accordion-type fold. The top of the folded paper will become the top of the crocodile's head and snout. This is where the children will use the white and black circles to create the eyes. Explain to the toddlers that alligators have short, wide snouts while crocodiles have long snouts. To create the look of a long snout, they will glue the crocodile's eyes near the back of the paper. The children should use the glue to attach the white circles first. The black circles will be attached on top of the white circles. Children will use the black marker to draw the nostrils. 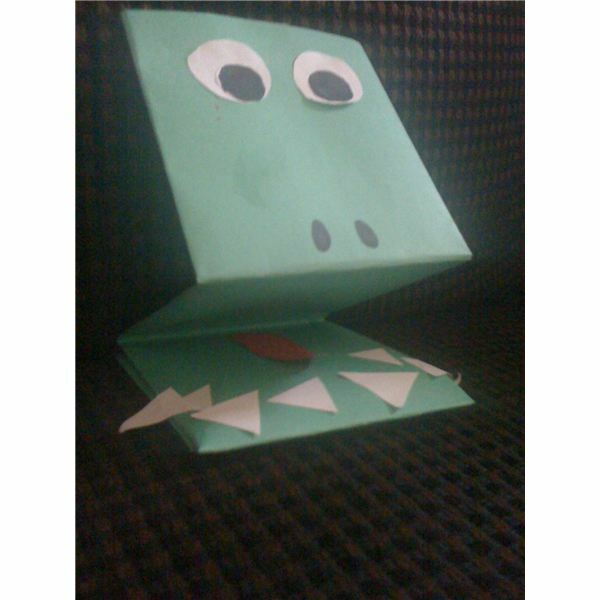 The inside fold of the green paper will be the crocodile's mouth. First the teeth will be attached with glue. Give each child seven of the small, white triangles. Have then glue five of the triangles inside the folded mouth. The final two teeth should be glued so that the points are actually sticking out of the mouth – with one on either side. Explain to the children that even when a crocodile's mouth is closed shut, you can still see two teeth stick out from the side. This is different from alligators. Alligators only show their teeth when their mouths are open. Glue the red construction paper tongue all the way to the fold on the inside of the crocodile's mouth. Finally, use the Scotch tape to secure the bottom fold to the bottom of the mouth so that the puppet now creates a "Z" shape. The children will have fun using their hands to move the mouth of their crocodile. Try reading "Crocodile's Toothache" by Shel Sliverstein. Let the children use their hand puppets to act out the parts when the crocodile talks, when the crocodile opens his jaws "wide, so wide," and at the end when the crocodile goes "SNAP!" A small group finger painting demonstration would be helpful before beginning the second of these crocodile crafts. Gather the children around the art table, and show them how they can use finger paint to create the open jaws, body, tail, and legs of a crocodile. 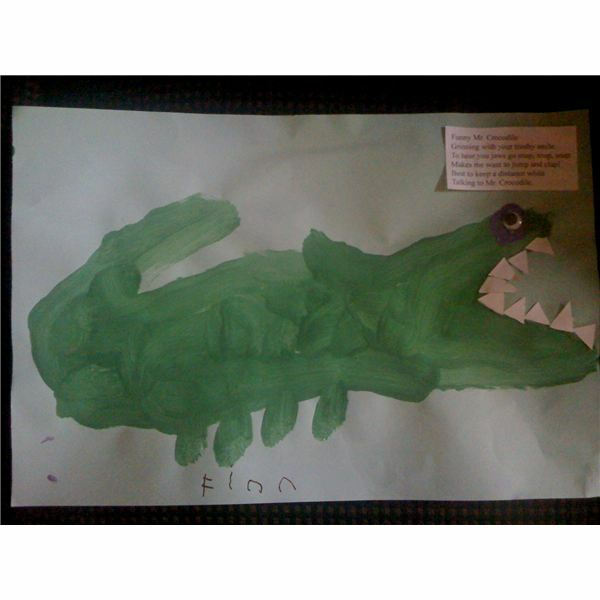 Encourage the toddlers to paint their crocodile so that it covers the entire length of the paper. For very young children, you may wish to instead use a template. 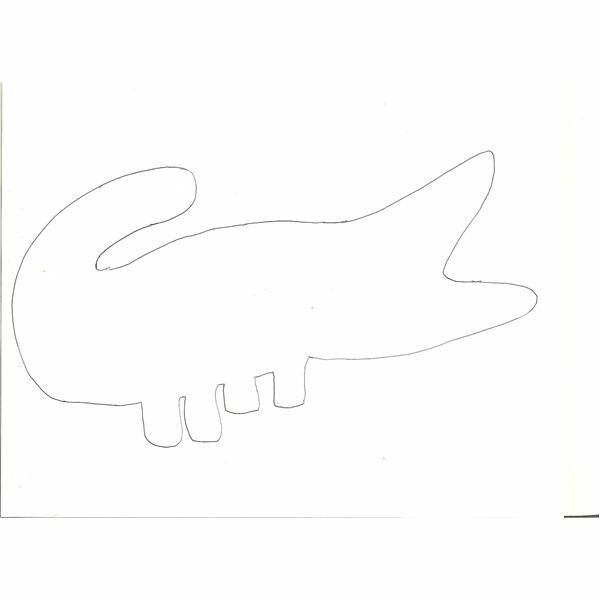 Enlarge the crocodile picture shown below, and then cut out the center shape of the crocodile. Show the children how they can lay the template over their construciton paper and then use their fingers and paint to fill in the missing part of the template. Give each child one piece of large construction paper and a small container of green finger paint. If you are using the template, each child should have their own. Give the children time to create their crocodile finger paintings. After clean-up, while the paintings are drying, teach children the crocodile poem shown below. Give each child their own copy of the poem, cut into a rectangle, which may be attached to the top of their crocodile painting. Once the paintings are dry, let students glue the teeth inside the open jaw. Use the Bingo marker to create an outer-eye and attach the googly eye for the inner-eye of the crocodile. Grinning with your toothy smile. Makes me want to jump and clap! These crocodile crafts for toddlers are wonderful additions to any crocodile theme or lesson on the letter C. Your students will love snapping into learning. If you have any additional ideas or suggestions, please feel free to share them in the comments below. The activiites offered in this article are the author's own, based on her extensive experience as a classroom teacher.